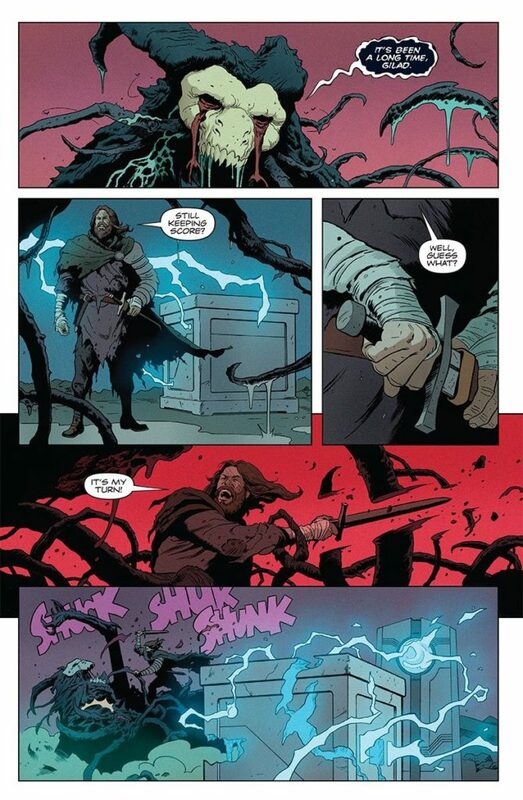 You are here: Home / Reviews / The Valiant #4 Review! What has been billed as “the battle 10,000 years in the making” comes to it’s close in the final issue of the limited series “The Valiant”. Last issue the monstrous entity known as the Immortal Enemy soundly defeated the combined efforts of virtually every hero the Valiant Universe has to offer as Bloodshot ferried off Kay McHenry, the current Geomancer, the target of the evil being. If Kay dies, a new dark age is set to befall humanity. The stakes can’t get any higher and the real question is can Bloodshot succeed where all of his compatriots have failed and keep the Geomancer safe? At some unrevealed point in the future, the Eternal Warrior fends off an attack from the Immortal Enemy as a large crate-like box is sent into the past. We recognize this box as the mysterious cargo that Bloodshot was sent to retrieve back in issue 1. In the present, while attempting to be opened, the box is triggered and a hologram of the future Eternal Warrior reveals that only his modern day counterpart may open it and it contains the only weapon capable of defeating the Immortal Enemy. Neville Alcott then orders the box to be raced to the fight, so it can be opened by the Eternal Warrior who, along with Ninjak, were leading the ill fated attack against the undying threat. If the first 10,000 years of stabbings didn’t work, surely it will this time! Meanwhile, holed up in a mall, Bloodshot is caught in a run and gun fight with the Immortal Enemy, constantly managing to keep Kay one step ahead of their ghastly pursuer. It’s easily apparent that there is no cavalry that will come to the rescue in time and the hapless Geomancer and her “white knight” are on their own against an enemy that can’t be killed. The face even a mother couldn’t love. There is some solid character building over the course of the series as Kay goes from a virtual frightened damsel, to this point when she determines that while she isn’t a natural fighter, she must stand up for herself and fight. For the first time ever, she becomes assertive and uses her powers offensively against her relentless ghastly stalker. And she does well! She stands up to her attacker and shows she needn’t be a helpless pushover. Unfortunately, she makes the rookie mistake of getting too close to her downed opponent and the Immortal Enemy lashes out at her, striking a mortal blow. Alcott, Ninjak and the Eternal Warrior helplessly watch this dire turn of events via security camera footage while Bloodshot bitterly – and ultimately in vain – strikes out at the ghastly Immortal Enemy, but the damage has been done. As the box finally opens, revealing a young girl in suspended animation, Bloodshot comforts Kay as she slowly dies. Using her powers, she seemingly dissipates the nanites in Bloodshot’s body, getting rid of his chalk white skin and reverting him to a seemingly normal person; something he’s long wanted. She then quietly dies in his arms. The funeral for Kay McHenry is attended by the assembled heroes, who, the Eternal Warrior insists, failed her in her time of need. Her loss is tragic not just because the heroes essentially lost this battle, but because, as a character, Kay McHenry had such nice development in this story and then she was cruelly struck down. We were made to care about her and then she’s gone. Written by Jeff Lemire and Matt Kindt with art by Paolo Rivera, The Valiant definitely tells an epic story! 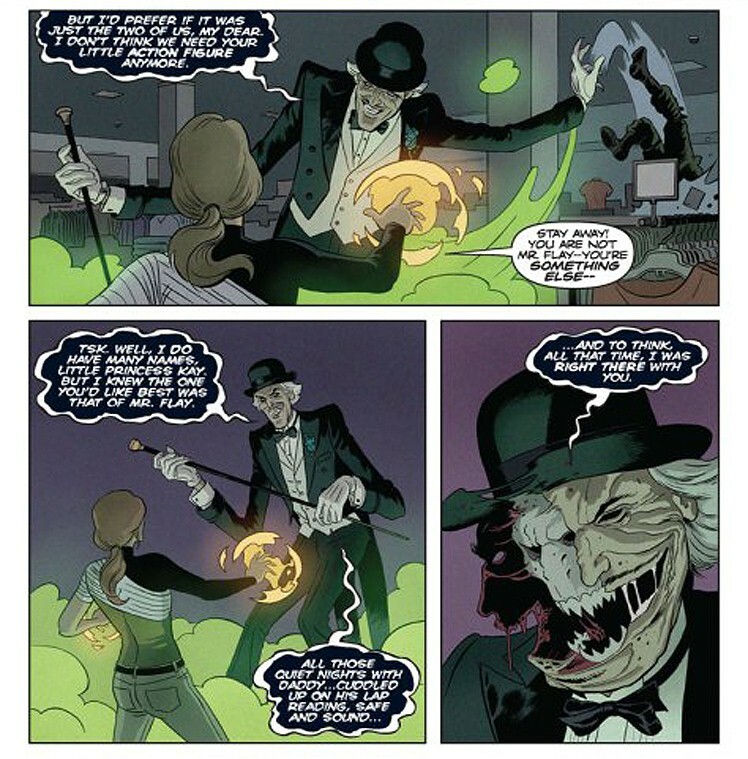 While it’s not a line wide crossover – the story is kept confined to the pages of the four issues of the series – the effects of this is easily set up to be felt around the Valiant Universe: The unnamed young girl in the box, the Geomancer from the future, is taken under the wing of the Eternal Warrior so he can keep her protected from harm; a changed Bloodshot wanders off, dropping off the map, not wishing to be found; and the Immortal Enemy literally disappeared! Did the future Eternal Warriors plan work; with a new Geomancer already in place at the time of the death of the current one, has an on coming dark age been thwarted? The story was very entertaining with high stakes and easy to understand character motivations and development. The art was well done, clean and easy to follow. The events here will definitely alter the status quo for a handful of characters moving forward!